/ Modified oct 17, 2013 9:27 a.m.
Local theatre group present their new play, Fuhgedaboudit! a fun exaggeration of mobsters. 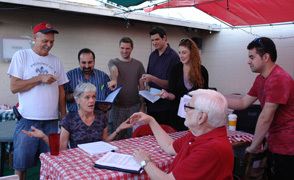 On a Tuesday night, the eight-member cast and crew of Murder Mayhem meet to rehearse at their new venue: Tony's New York Italian Deli. The small restaurant is the setting for the theatre group's new mystery dinner theatre show, Fuhgedaboudit! The cast of Murder Mayhem's latest show, Fuhgedaboudit! "Fuhgedaboudit! is about the Godfather, who is (now) looking to retire, and is about to name his successor," says Sheldon Metz, co-founder of Murder Mayhem, and the production's director. "The Don has called everyone here for this wonderful meal at Tony's New York Deli, and there's infighting among the family about who is going to take his place." In mystery dinner theatre, a character is usually murdered during the first act, and then the audience has to solve the mystery. They get to vote on who they believe committed the murders, Metz explains. Attendees are encouraged to come in gangster-like costumes. Metz has a Hollywood background, including working on The Godfather Part II. (He calls actor James Caan, "Jimmy.") But he says his real love has always been theatre. Throughout his career, Metz has directed more than 160 plays, and won 20 directing awards. Part of what is fun about mystery dinner theatre is exaggerating stereotypes. "It's done in good fun," Metz says. "It's tongue in cheek, and a lot easier to take than Goodfellas." Fuhgedaboudit! was written by John Vornholt, the group's other co-founder. Vornholt has spent most of his career writing sci-fi. "I wrote some 65 or 70 novels," he says. "I'm probably best known for my 30-something Star Trek novels. Needless to say Vornholt also has a Hollywood background. He's written for screen, radio and TV. But writing for stage is much different that the styles he's done in the past. Vornholt says murder mystery dinner theatre audiences tend to suspend their disbelief more readily than novel readers, which means the pressure is off the writer to make the story perfectly logical. "Even though they might go home and say, 'You know, that murder made no sense whatsoever!' That murderer couldn't have done it! '...that's OK. As long as they laughed and had a good time, I'm OK."
As fun as it is, there are challenges to writing theatre. For instance, when Vornholt writes a novel, he’s essentially telling a story to one person at a time. He finds it more difficult to write for stage, because he is telling a story to very diverse audience members. He has to find the right words, timing and action to keep each person engaged. And, Vornholt says, this keeps him on his toes. Vornholt wrote the script, but he knows the actors are going to end up improvising at least half of the show. They are expected to banter with the audience, and come up with their own funny lines on the spot. Both Metz and Vornholt say the audience is what makes mystery dinner theatre so high-energy and unpredictable. Most of the success comes from how funny the audience is, and how willing they are to play along with the cast. John Vonrholt rehearsing his role as mobster Vinnie Fat Ears. He says that not all people want to always go to a Shakespeare play or a musical. "As a connoisseur of theatre, i think (mystery dinner theater) has its place," Ralstin says. "(For people who) want to go and have a good time...mystery dinner theater gives them that outlet. The magic of theatre can be found anywhere...I don't think theatre should be contained."